Which hotels do celebrities like to party at? Diana Jenkins hosted a party at The Peninsula Beverly Hills to launch her book Room 23, featuring George Cooney, Cindy Crawford and others in that hotel’s room 23. As far as I can tell, the book is a collection of photographs taken in a suite at some hotel (maybe the same hotel where they had the release party?) and the subjects include lots of celebrities. Resort staff has reportedly been ordered to refuse to serve her any more alcohol, so she’s doing what anyone, and by anyone we mean 20-year-olds on spring break, would do – sneaking up behind other vacationers and snatching their drinks! I’ll try to be back with some real travel planning stuff later in the day. Hip Hotels, a collection of ‘highly individual places’, was first published by Thames and Hudson in 1999. It became an immediate publishing success, briefly even outselling Harry Potter. An interesting hotel can certainly make a vacation more memorable. When I went to Algonquin Park I saw a moose. I also pumped water for showers in the ecolodge we stayed at. I tell the pumping water story more often than the moose sighting story (although both experiences were pretty memorable). This old blog entry has some stuff on weird hotels and the links still work. Virgin says it is marketing the brand on the quality of service, rather than price, but there are some reasonable deals. Rooms at the Hotel on Rivington, a swish design palace in New York’s Lower East Side, usually start at around $500, but Virgin and Hip Hotels are offering three nights, including flights on Virgin Atlantic and private transfers, from Â£935. You can see that the article is a bit short on details (we get Demi Moore’s hotel but nothing about where in Italy Jennifer Lopez visited). It may not be a celebrity thing, but this blogger is having a nice honeymoon in Hawaii. I didn’t see a lot of travel tips, but sometimes it’s just nice to see someone sharing a good time. The pictures are excellent as well. There is some Hawaii stuff on this blog of course. This one might have been the most recent. This is one of the oldest. A search will reveal many in between. I don’t have much time because I have class in a few minutes, but I thought this article was pretty interesting. I hadn’t realized that so many musicians have died in plane crashes. The only one I had really been aware of was the Buddy Holly, Ritchie Valens, and “Big Bopper” J.P. Richardson crash in 1959 thanks to the song American Pie. Even though I really like Jim Croce, Stevie Ray Vaughan, Randy Rhoads, and Glen Miller I just had not known that they were plane crash victims. What did Michael Phelps do on his last vacation? This article talks about Michael Phelps’ vacation in Portugal, specifically the Algarve. By the way, over 3 years ago, we published a travel plan for Lisbon and the Algarve. Anyway, it sounds like the greatest Olympian of all time just wanted to relax after winning those 8 gold medals – no doubt he would have found our travel plan a bit more active than his plan: relax, golf, go to nightclubs. Of course there’s one big activity missing from that list: eating! Then again, a guy who eats a pound of pasta for dinner is probably eating too fast to taste the food anyway so we wouldn’t expect much of a restaurant review from America’s biggest Olympic story anyway. Michael Phelps left the Beijing Olympics with a record eight gold medals, adding to a career tally of 14, so where is the golden athlete heading next? The twenty-three year old American swimmer is on route with some friends to a golfing vacation in Portugal’s Algarve region. He will relax at Hotel Hilton Vilamoura As Cascatas Resort and Spa, and enjoy some of the best golf in the world, up to par for one of the world’s best swimmers. How is Michael Phelps one of the best instead of the best swimmer in the world? Anyway, Phelps did say he would return to the Algarve if he had a chance. Maybe next time he can try our travel plan. For now he’s too busy giving swimming lessons. Have you ever seen a pool so crowded? Actually the water park I went to in Ducksan was close but there were more people in the water and fewer people taking pictures. My apologies to all you golfers reading this. I can’t say much about golfing in Portugal. I’m not much of a golfer (though I have a cool story about a Buddhist monk trying to teach me how to swing a club in a little driving range set up behind a temple) and all I have for you is this old article on golfing in Vegas. Today I plan to teach you how to meet super models on vacation. The lesson doesn’t really come from me (not that I’m not an expert! ); it comes from this article on where to go to meet super models while they are on vacation. Our society being what it is, educators just don’t make the same money as super models so my chances of paying 19,200 dollars a night (is that one of the most expensive hotel rooms?) at Badrutt’s Palace in St. Moritz are pretty slim. Not that Claudia Schiffer, Liz Hurley, and Kate Moss are about to try to steal me away from my wife anyway. Which one will you be visiting? Me, I’ll keep working on my Alaska vacation plan. Both European designer Jade Jagger and reclusive French football player Zinedine Zidane have long been seduced by the island’s quieter alter ego and own vacation homes in the less-touristed north, where a more tranquil scene rules. And speaking of different experiences, I’ll be going to the LARP (live action roleplaying) site I wrote about last month. This weekend I won’t be posting new blog entries or approving comments. One & Only Ocean Club Bahamas: how is it? If you want to see celebrities on vacation, one possibility might be the One & Only Ocean Club in the Bahamas on Paradise Island. I’m told that it was featured in the opening scene of Casino Royale and that Julia Roberts and Clive Owen shot scenes of Duplicity there. Robert Deniro supposedly rented out the entire hotel for his son’s wedding. Even this place gets mixed reviews, however. Has anyone been there? How was the service? Any celebrity sightings? By the way, I would have linked to the official site, but One & Only (funny name for a chain, isn’t it?) has an annoying flash website so I can’t link directly to the Bahamas resort. There aren’t too many people who wouldn’t enjoy a spa vacation. I mean who doesn’t want to get pampered on vacation? This article reminds us that celebrities do. The article promises to tell you about “rates from $422/night at exclusive, pampering holiday hotels” and while that is expensive is nothing compared to this next place. Interesting how they combine the pampering of a spa vacation with teepees. And what is a high-end teepee anyway? They better be nice for $2,000 / night. The 90-degree main pool measures 405 feet in length, with a diving section and Olympic-size swimming lanes; an adjacent 104-degree therapy pool is a mere 100 feet long. On a night last month, the pool glowed turquoise, steam rose 30 feet, and “Le Freak” by Chic played over the sound system. Bodies appeared and disappeared as the mists tumbled over the water’s surface. At $169/night (and up) it’s a bit more affordable than the new teepees being built. Back to expensive stuff, this article mentions Bora Bora Pearl Beach Resort & Spa and Jaguar Reef Lodge and Spa as top 5 dream vacation destinations. This article on romantic vacation ideas for couples who have been together for a while also mentions spa vacations, namely learning a sport like golf at a resort with a nice spa. If you don’t like golf, you can always “court each other at a resort in a couples’ sensuality workshop.” If you love golf then read this article. And this is an old article I’ve been hanging on to for a while. Time to get rid of it! It has got spas from New York to Africa and that focus on yoga, spirituality, etc. I first heard about the Hills of Chocolate in my Cebu Pacific in-flight magazine. 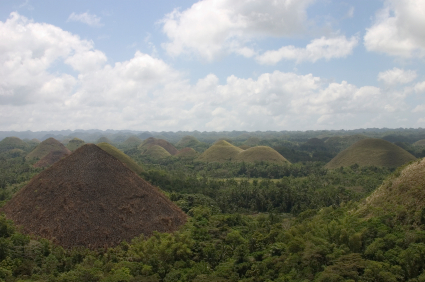 I read that these hills are Bohol Island’s most famous attraction. The city of Tagbilaran is likely to be your base for exploring the Hills of Chocolate, Baclayon Church, a waterfall in the rainforest, the Tarsier (the world’s smallest primate) Visitor Center, plus beaches and dive spots. Apparently this is a popular place with celebrities: Robin Williams (one of my favorite actors), Daniel Radcliffe (the Harry Potter guy), and Eugene Kim (it says “Korean star Eugene Kim” but that could be an actor or an actress since Korea has both a famous male Eugene Kim and a famous female Eugene Kim). Anyway, I just wanted to share this very cool picture with you. I’m definitely putting Bohol Island, Tagbilaran, and the Hills of Chocolate on my places to go list. It’s a beautiful place for hiking and it’s not the kind of mountain scenery you can see in a few places. As far as I know, Tagbilaran in the Philippines is the only one place to go to see something like the Hills of Chocolate. For more on the Philippines see: Plantation Bay 1, Plantation Bay 2, Plantation Bay pictures, Manila and Palawan, when to visit Boracay. See our small but growing collection of travel pictures.